Stroll through any Beijing park, or venture down any hutong (narrow alley) and you are sure to spot them right away: four players hunched over a square table with a mass of decorated tiles the rough size of dominos. This is Mahjong, China’s national pastime, and passion. Mahjong is a four-person game of skill, strategy, cunning, some luck, and the occasional sneaky maneuver. It’s known to stave off dementia or bring on epileptic attacks. It spread abroad like wildfire once missionaries and diplomats discovered it and today is played all over the world. Mahjong may look like dominos with its 144 tiles decorated with Chinese characters, but the objective of the game itself is more like rummy: to collect complete sets of tiles while preventing the other players from doing so. It’s been helping the Chinese pass the time since 500 B.C., when, many Chinese believe, Confucius himself invented the game. This has never been definitively proven or denied, and it is likely that the legend persists because the three dragon “honor” tiles correspond in their color-coding to the three tenants of Confucianism: benevolence, sincerity or wholeness, and filial and spiritual piety. Is Mahjong as old as The Flood? Another popular legend suggests that Noah and his sons passed the forty days and nights on the Ark during the Biblical Flood playing mahjong. This admittedly far-fetched notion is explained by the dominance of the east wind in the mahjong, the same wind that pushed the Ark over the flooded waters, and the importance of pairs in both the Ark story and the game. Mahjong is played at a square table with 136-144 tiles (depending on the version you are playing.) The tiles are shuffled, face down on the table. Each player chooses a total of 35 tiles from the general pile and constructs a “wall,” that is 17 tiles long and two tiles high. From the wall, each player chooses 14 tiles, which is like their hand of cards. In this scene from The Joy Luck Club, the players begin the game by shuffling and building their walls, while discussing the superiority of Chinese Mahjong to “Jewish” Mahjong. The tiles are divided into three categories: three simple suits, 2 sets of honor tiles, and 2 sets of bonus tiles. The honor suits consist of 16 tiles representing the four winds: north, south, east, and west; and 12 dragon tiles in red, green, and white. Bonus tiles are not used in every version of mahjong, but they include 4 four flowers: plum blossom, orchid, chrysanthemum, and bamboo, and the four seasons. American Mahjong also includes joker tiles. Mahjong can seem complicated to the neophyte, but the object of the game is simple: to discard and pick up tiles until you are the first to arrange 14 tiles into four collections of three and one identical pair. Collections can be either a “pung” which is three of a kind or a “chow,” which is a consecutive sequence akin to a flush in poker. Different versions of the game allow for “wild cards” or substitutions. The first player to arrange the 3-3-3-2 collections wins. What Really Happened During That Crazy Rich Asians Mahjong Scene? In the recent blockbuster hit Crazy Rich Asians, a tense scene between the heroine, Rachel and her boyfriend’s mother, Eleanor Young is played out over the mahjong board, with all kinds of symbolism and significance that may have alluded Western viewers. It underscores the ubiquitous quality of Mahjong, which is equally popular at all strata of society. Eleanor disapproves of Rachel’s relationship with her son, Nick, the heir to the Young family’s immense fortune. In a classic “baddy mother-in-law” move, Eleanor hires a private investigator to learn more about Rachel’s past and reveals that Rachel’s mother conceived her out of wedlock, then fled to the United States to avoid censure. Rachel’s illegitimacy in Eleanor’s eyes makes her ineligible to marry Nick. Rachel runs away, only to be pursued by Nick, who is ready to turn his back on his family and marry Rachel. Rachel invites Eleanor to a distinctly working-class mahjong club, and the two play a game that mirrors their real-life struggle. Rachel has a strong hand: an identical pair, 3 of a kind, and two complete sequences in the bamboo suit: 1,2,3 and 4,5,6. She also has a 7 and a 9 of bamboos and an extra tile. She picks up the exact tile she needs: the 8 of bamboo, but then she lets it go, aware that Eleanor also requires the 8 of bamboo to complete her hand, adding it to the 2 similar tiles she already has. Eleanor “steals” the tile and declares victory. But then….tah-dah! Rachel reveals her own tiles and Eleanor understands that she could have won the game. After a moment’s bafflement — why would anyone throw a game?– Eleanor begins to understand Rachel’s strength of character, which is, after all, not so different from Eleanor’s own. And that’s how she gets the emerald ring! This is what I was able to glean from the scene. I was intrigued by this deeper dive into more of the cultural nuances of the scene in this Vox piece by Jeff Yang. Subscribe to receive updates when new posts are published. The Communists outlawed Mahjong when they came to power in 1949 in an unsuccessful attempt to curb the national obsession with any form of gambling. Mahjong was forced underground for almost forty years until the ban was lifted in 1985. These days, Mahjong players can be found everywhere. Playing Mahjong is a great window into life in China. Enterprising expats have set up a school for aspiring foreign Mahjong players in Beijing, and visitors to the capital can attend an introductory class, or more advanced sessions, designed to get you out on the streets and playing with the locals in no time. Visit Culture Yard to learn more. Mahjong tiles and their decorative boxes have long been prized souvenirs from China. Antique Mahjong tiles made from bone or ivory are cherished family heirlooms, though spare tiles have become fashionable jewelry accessories in recent years, which has made their already steep prices soar. More recent vintage or modern plastic equivalents made from Bakelite and Catalin are more affordable and can be found for reasonable prices at Hong Qiao Market (The Pearl Market) near the Temple of Heaven and the sprawling weekend Panjiayuan Flea Market. Thank you for visiting and enjoying another travel post! I think that travel knowledge is best when shared, so please do weigh in below in the comments section. 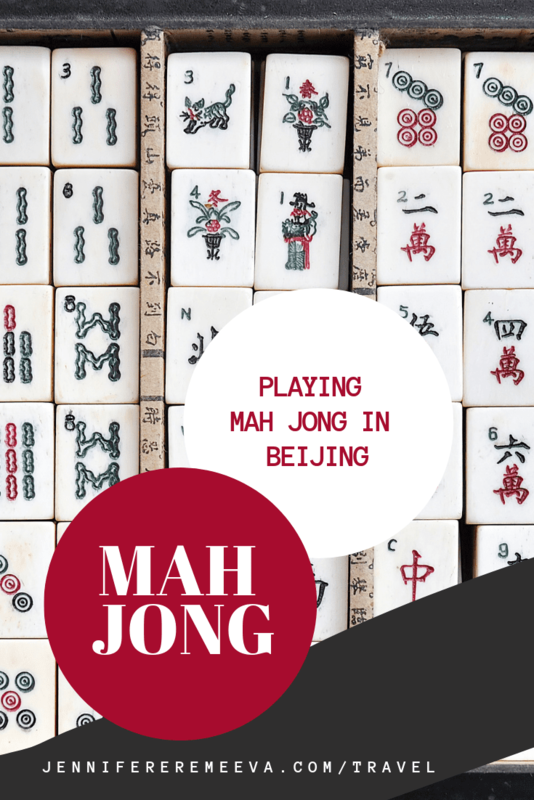 Have you played Mahjong in Beijing? Tell us about it in the comments section below, or via social media. You can find more mouth-watering pictures of antique Mahjong tiles on my dedicated Travel to Asia Pinterest Board. This post was originally written in partnership with Alexander+Roberts, the leading American tour operator. Their popular Be a Beijing Insider explores the capital’s hutongs, where, more likely than not, you can catch a game of Mahjong in progress. I play Mahjong since i was 5 years old. I often trained with my father. Especially new and exotic variants of Mahjong, which you can play online, I find very interesting. However, when I play with real Mahjong, I play according to the National Mah Jongg League rules.